international water institutions and activities. 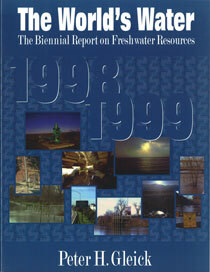 The book features more than fifty charts, tables, and maps that present the most current data on a range of factors including: the availability and use of water; numbers of threatened and endangered aquatic species, dam and desalination capacity worldwide; trends in several devastating water-borne diseases; changes by region in global precipitation patterns since 1900; and much more. To be published on a biennial basis, The World's Water will be an essential reference for water resources specialists with both government agencies and nongovernmental organizations, resource economists, planners, public policy and public administration experts, environmental lawyers, students and anyone concerned with water issues. "Anyone who cares deeply about the human need for water and the future of this planet should take careful note." "Essential for students of water—whether environmentalists, educators, engineers—or water policy planners in whatever capacity. A valuable contribution to the water literature as well as an important resource tool." "The World's Water is an important contribution…. It should be compulsory reading for students of water resources." "This book takes a truly impressive bite out of an enormous topic. Interested lay readers, students of natural resource management, and water experts will all find abundant use for The World's Water." "There are few books that can genuinely be described as indispensable. This is one….essential reading." "Dr. Gleick has once again produced the essential book on water. The 2004-2005 edition will be an indispensable addition to our bookshelf." Chapter 3. The Status of Large Dams: The End of an Era? Chapter 5. Climate Change and Water Resources: What Does the Future Hold? -Is the Hydrologic System Showing Signs of Change?